VolumeTouch is a basic Windows Shell addon which is both easy and simple to use, but also integrates nicely inside the system tray. Its main function is to adjust the system volume level as an alternative to the normal click and side procedure. In terms of extra features, VolumeTouch and quickly adjust various volume properties like audio recording, playback, etc. 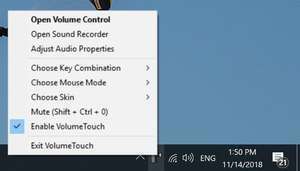 VolumeTouch, unlike Windows volume control, also supports hotkeys for quicker access to changing the system volume -- a good thing in the days of video ads randomly playing commercials. For security reasons, you should also check out the VolumeTouch download at LO4D.com which includes virus and malware tests. Additional screenshots of this application download may be available, too.